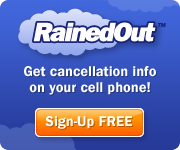 Attn fans and racers- The 2012 Engine Pro ASCS Sprints on Dirt schedule has had a couple of late adjustments- the Sept 28 date has been cancelled and the October 6 TBA is off the schedule as well. The great news is Tri City Motor Speedway in Auburn, MI has agreed to host the seasom championship race on Saturday Sept 22! More details about this great finale will be coming soon. event at the racy 1/4 mile oval. his fine sponsors and crew. Brodix Heads dash went to Shawn Dancer. 5. 4 Eric Smith, 6. Joe Geibe. 5. 00 Ryan Grubaugh, 6. 21t Troy Chehowski, 7. 20a Andy Chehowski, 8. Brackenberry, 12. 4 Eric Smith, 13. 70 Jim Lingar, 14. 89 Chris Pobanz, 15. On a beautiful evening at Cherry Raceway Dustin Daggett took the checkered flag for the Engine Pro ASCS Sprints on Dirt Presented by ARP main event at the exciting ¼ mile oval. Daggett of Portland, MI started in third position for the twenty five lap main event. There were only two cautions that slowed the event. A battle developed early with Jared Horstman and eventual winner Daggett. The feature winner in his Maxim chassis was able to capture the $1,200 first prize in exciting fashion after that challenge. Several battles developed throughout the field with Gregg Dalman, Ryan Grubaugh, and Shawn Dancer all swapping positions in the later stages of the feature. Daggett stated: “It’s been tough getting wins with SOD this year, and I’m happy to be in the Engine Pro winners circle at Cherry Raceway tonight.” The winner of the Engine Pro ASCS Sprints on Dirt Presented by ARP feature thanked his fine sponsors including Miles Petroleum, Sweet Manufacturing, and Richardson Farms. Heat race wins were captured by 31 Andy Teunessen, 49t Greg Dalman, and 17 Jared Horstman. Brodix Head Dash went to 16c Greg Wheeler. 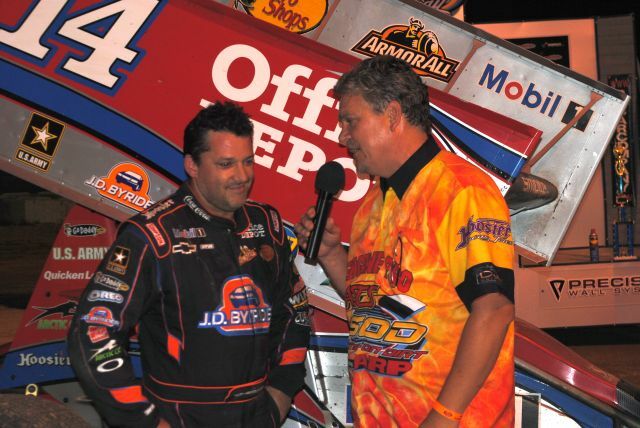 Plymouth, IN – (August 18, 2012) – Tony Stewart won Saturday night’s Engine Pro Battle at the Bullring presented by Hastings Manufacturing, Mahle/Clevite, and Melling Engine Parts with the Engine Pro ASCS Sprints on Dirt presented by ARP at Plymouth Speedway. Stewart led all 30-laps of the feature event on his way to victory, but the last five laps were side by side swapping lines with Ryan Grubaugh. On the final lap Stewart protected the bottom while Grubaugh motored to the top, shooting off the end of the track onto the larger paved oval. Grubaugh salvaged a fourth place finish. Steve Irwin and Stewart started on the front row of the 30 lap main event. Stewart took the lead from the start while current ASCS SOD point leader Gregg Dalman moved into second spot around Irwin. Dalman stayed close to Stewart through the first portion of the race when Nate Bostrum spun in turn two with four laps in. Stewart was able to pull away during the restart and open up a sizeable advantage. This is when Grubaugh began his charge from 12th starting position after having to run the B-Main event after failing to go to the scales following his heat race event. Grubaugh started motoring around the top side of the 1/5th mile oval and broke into the top five by 12 and was up to fourth position on lap fourteen when the caution flew for Jay Steinbach spinning off turn three. The caution helped close the gap Stewart had opened up vanished for the restart. Grubaugh went right to the top and took over third on lap 17 from Irwin and then battled with Dalman for the second spot. Grubaugh passed Dalman on lap 20 and began his pursuit of Stewart. Meanwhile Stewart was mired in heavy lapped traffic. It was the opportunity Grubaugh needed as he closed quickly on the 2011 NASCAR Nextel Cup Champion. With three laps to go Grubaugh made his move and got the bottom away from Stewart in turns one and two. Stewart managed to hold onto the lead as the duo exchanged lines racing side by side over the final two laps. On the final lap Stewart held the bottom while Grubaugh went to the top line he had used so well throughout the race. Going into turn three Grubaugh banged the cushion and drove off the end of the race track. Stewart went on to win while Dalman and Irwin claimed second and third position. Grubaugh and Ryan Ruhl rounded out the top five. Dalman, Brett Mann, and Stewart won the heat race events, Andrew Chehowski won the Dash, and Grubaugh won the B-Main event. Engler Machine and Tool Heat Race #1 Heat Race #1 (10 Laps): 1. Gregg Dalman, , 2. Trey Smith, 3. Troy Chewhowski, 4. Dustin Shriver,5. Ryan Ruhl, 6. Jay Steinbach, 7. Eric Smith. Butlerbuilt Seats Heat Race Heat Race #3 (10 Laps): 1. Tony Stewart, 2. Andy Teunessen, 3. Robert Huisken, 4. Andy Chehowski, 5. Joe Geibe, 6. D.J. Lamance. A-Main (30-Laps); 1. Tony Stewart, 2. Gregg Dalman, 3. Steve Irwin, 4. Ryan Grubaugh, 5. Ryan Ruhl, 6. Andy Teunessen, 7. Trey Smith, 8. Troy Chehowski, 9. Greg Wheeler, 10, Dustin Shriver, 11. Brett Mann, 12. Nate Bostrum, 13. Robert Huisken, 14. Andy Chehowski, 15. Jay Steinbach, 16. Don Bostrum.